Theres a couple of new models at the HP site. 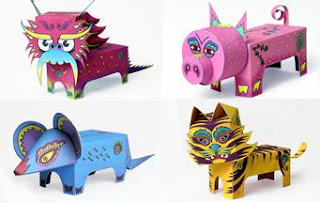 Get these colorful 3D Chinese zodiac animals together with trains, animals, an insect, a robot and even some origamis. Choose "toys, stickers & puzzles" for the category and then "games" for the subcategory to find the other 3D models. Thank you for the link, they are very pretty and soon I will be making one.